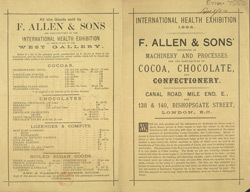 In the 19th century it was fashionable to make confectionery as colourful as possible with many and trimmings. Home made cakes were usually decorated with sugar decorations that could be bought from a confectioner’s store. It is understood now that many of these decorations were actually made from poisonous and toxic ingredients but this was not understood at the time. Unfortunately some of the ingredients did considerable damage. Arsenic was used to made colours like green and blue, yellows and reds contained lead and gold and silver were made with copper and zinc.